This radiant art piece is a modern twist on nostalgic 70’s wall decor. 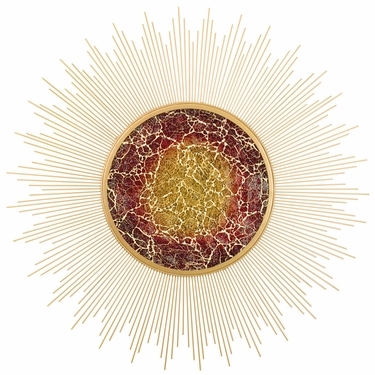 The overlay of crackled glass over fiery colored foil gives a unique quality to the center of this sun wall decor. The golden rays are made with metal rods and arranged to provide a dynamic and energetic quality. Take home this Large Mosaic Sunrays Sun and capture sunshine for your home and garden all year long. This gorgeous sun is made of durable metal and glass and will look absolutely stunning in your home or garden! Clear lacquer is applied to make it weather resistant for outdoor use.